Hair matters. 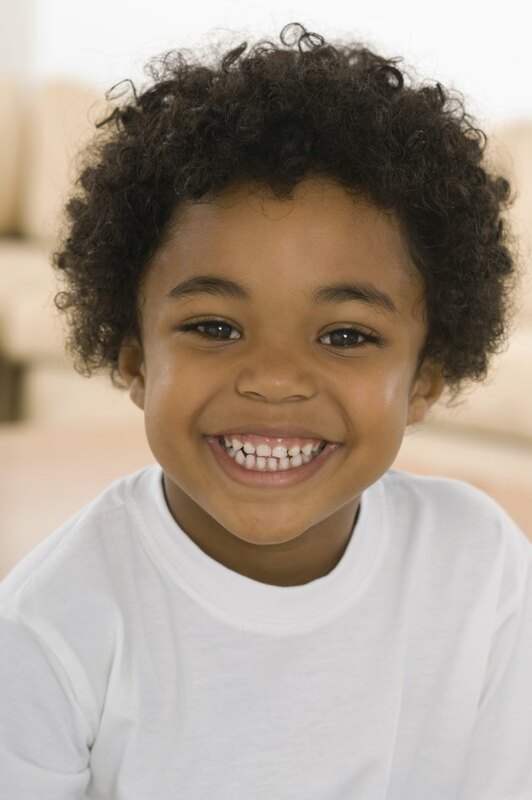 The Adoption Resources of Wisconsin shares that hair is an important cultural reflection for a child and can help instill self-confidence when cared for correctly. In addition to being curly, black hair is unique from other hair types in that it’s naturally drier, coarser and more densely packed. Because black hair also has fewer cuticle layers, it’s more vulnerable to damage and breakage if you don’t use the right hair care products. Wash the child’s hair every seven to 10 days. Shampoo can cause a black child’s hair to become overly dry, so WebMD recommends using a moisturizing shampoo intended for people with dry hair. Alternatively, the Pennsylvania Child Welfare Training Program says that you can use a shampoo that has a pH of 5 to maintain the natural shine of your child’s hair. If your child isn’t old enough to wash her own hair, lather 1 tablespoon of shampoo into her hair and use your fingertips to distribute it and massage the scalp. Rinse out the shampoo with warm water. If your child’s hair is thick, shampoo and rinse her hair again. Condition your child’s hair daily. Always use a conditioner after shampooing the child’s hair. Co-wash black hair with hair conditioner, a technique in which you “wash” a child’s hair with conditioner instead of shampoo. Apply the amount of conditioner recommended by the manufacturer to your child’s hair. Before rinsing out the product with warm water, gently detangle the wet hair with a comb. Dry your child’s hair. Use a bath towel if you want the hair to air-dry. To speed the drying process, use the low heat setting on a hair dryer that has a diffuser attachment. Comb your child’s hair with a comb or brush made with soft natural bristles. If your child has longer hair, you may need to divide it into at least four sections. Start at the nape of the child’s neck and gently comb his hair to work out any knots and tangles. Apply leave-in conditioner or hair oil as you brush his hair. Style your child’s hair. Hairstyles to try include loose braids, cornrows, twists, ponytails or leaving the hair down. When washing your child’s hair, don’t gather it up at the top of her head because this can cause it to tangle. Avoid shampoos that contain sulfates, lauryl or laureth because they can strip a child’s hair of its natural oils and are not ideal for curly or black hair, according to the Pennsylvania Child Welfare Training Program. Avoid hairstyles that pull the hair too tightly because they can cause the hair to break.